We construct an efficient classical analogue of the quantum matrix inversion algorithm [HHL09] for low-rank matrices. Inspired by recent work of Tang [Tan18a], assuming length-square sampling access to input data, we implement the pseudo-inverse of a low-rank matrix and sample from the solution to the problem Ax = b using fast sampling techniques. We implement the pseudo-inverse by finding an approximate singular value decomposition of A via subsampling, then inverting the singular values. In principle, the approach can also be used to apply any desired “smooth” function to the singular values. Since many quantum algorithms can be expressed as a singular value transformation problem [GSLW18], our result suggests that more low-rank quantum algorithms can be effectively “dequantised” into classical length-square sampling algorithms. Gilyén, A.P, Lloyd, S, & Tang, E. (2018). 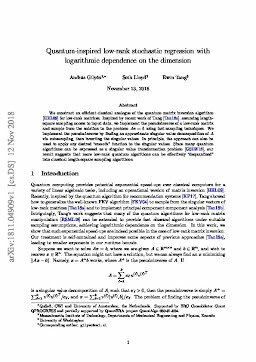 Quantum-inspired low-rank stochastic regression with logarithmic dependence on the dimension.